Ajebesone P. E. and Aina J.O. 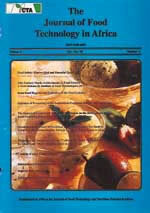 The potential of four selected tropical vegetables, Grongonema latifolium (Utazi), Vernonia amigdalina (Bitter leaf), Azadirachta indica (Neem) and Garcinia cola (Bitter Kola) as substitutes for hops in tropical beer brewing were evaluated. The vegetables were processed into powder by drying at 50°C for 24 hours (such that they maintained their original colour) and then cooled in dessicator before milling in a hammer mill. Proximate analysis showed that these vegetables had protein and crude fibre values comparable to those of commercial hops. Fat content values were however much higher than those for hops with Grongonema latifolium having the highest values of 19.10%. Garcinia cola with a total resin value of 8.24% and an essential oils value of (1.16ml/ 100g) had values which were significantly different from those of hops. The other three had values comparable to those for hops. Bitterness levels were high when the vegetables were extracted with organic solvents, than with distilled water. These values however decreased, the longer the storage period. Losses in bitterness were more when the vegetables were stored at ambient temperature than when they were stored at refrigeration or freezing temperatures. Losses in bitterness were more for water extracts than for organic solvent extracts.